How do I edit my account settings in Commons? As an admin, you can manage account settings. Settings are saved automatically as you make changes. You can allow approved content for your Commons account. Approved content is indicated in search results by a customizable banner and image. To allow approved content, enable the Allow Approved Content option . To select a custom background color, click the Select background color button . To upload a custom image, click the Select image link . To reset the custom image back to the default (a white checkmark icon), click the Reset to default link . To prioritize approved content in search results, click the Prioritize approved content in search results checkbox . You can allow other users to manage approved content. Type the name of a user in the field and press Enter (PC) or Return (Mac) to give them permission to curate approved content . Note: Custom images must be 50x50 pixels in size and the file format must be either JPEG, PNG, or SVG. By default, users will be able to share and view public content. To disable public sharing, deselect the Allow users to share to public account setting . This will remove the Public option when finding a resource in Commons and the Share with public (All Canvas users) option when sharing a resource to Commons. To prevent users in your account from viewing publicly shared content, deselect the Allow users to view publicly shared content setting . This option will hide all publicly shared resources from your Commons account. Authors of publicly shared resources will always be able to view their resource. If the Allow users to view publicly shared content option is disabled, admins will not be able to view public resources and discovering users will not be able to view updates to previously imported public resources. You can configure default search filters in Commons. Default search filters are automatically applied to all search results in Commons. However, users can modify filters for individual searches. To turn on default search filters, enable the Configure default search filters option . To only display approved content in search results, enable the Only Account Approved Resources option . 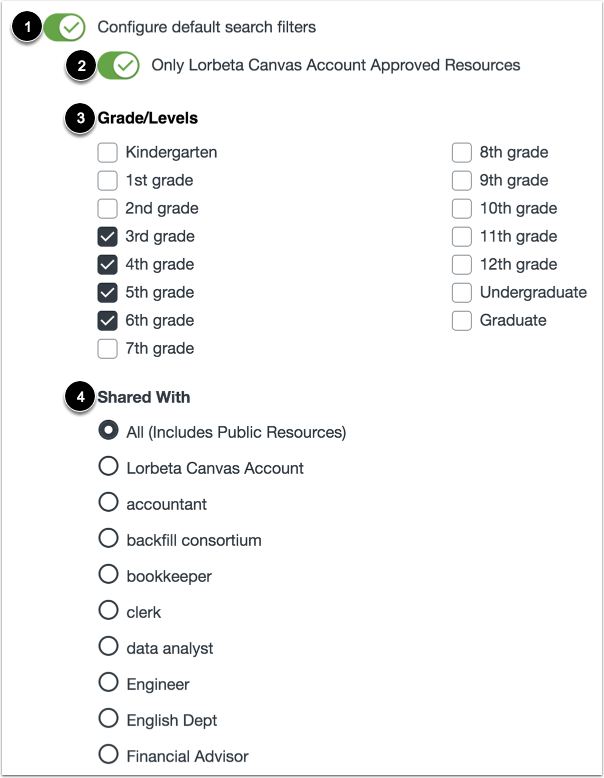 To filter content based on grade/level, click the checkbox next to the desired grade/level . To filter content based on sharing and publicity settings, select an option from the list . By default, Standards & Outcomes settings are enabled. 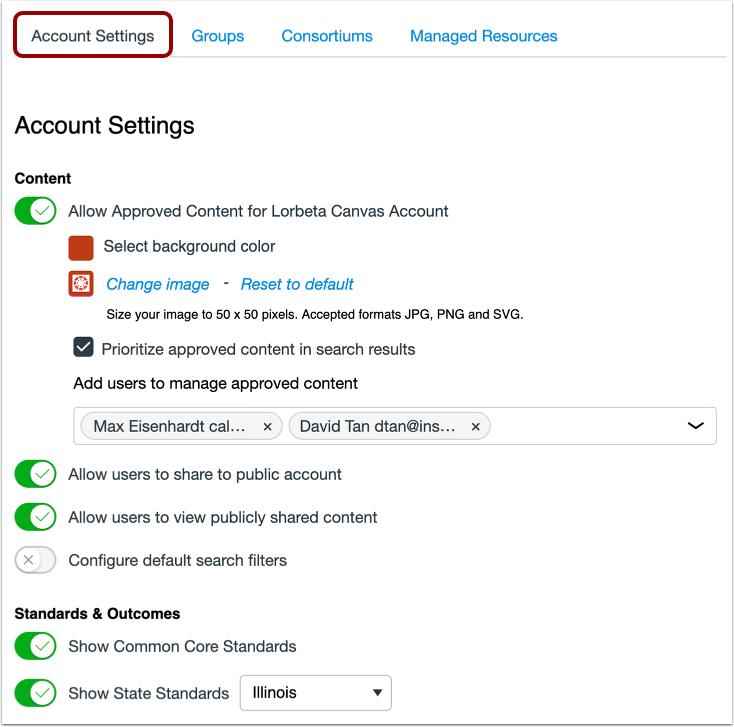 To disable users from tagging federal or state standards to shared resources in Commons, click the Show Common Core Standards  or Show State Standards  button to turn off the option. Previous Topic:How do I view account settings in Commons? Next Topic:How do I manage shared resources for my account in Commons? Table of Contents > Admin Users > How do I edit my account settings in Commons?